Type: Looping Starship with the shell from "Bounty"
Bounty's Revenge was a beautifully themed fiber-glass boat that appeared to be constructed of old wooden planks. The ride began with a smooth, powerful rocking motion that increases in speed as the boat climbs higher in the arc it is traveling. As it reaches the top of the arc, it comes to a virtual stop, upside-down, with nothing between the heads of its riders and the ground, hanging there not knowing whether the ship will go forwards and complete the first of two loops, or backwards, to try from the other side. When the ship completes the loop, riders will experience a brief sensation of being able to fly. 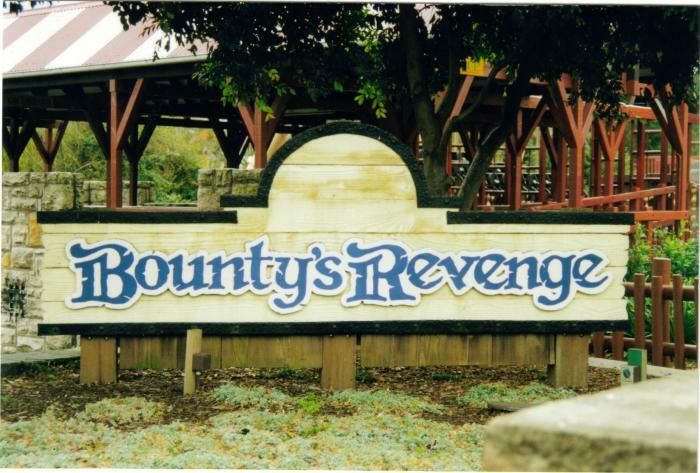 Originally the ride was operated by 3 cast members. An operator, a loader and an unloader. As time moved on it was reduced to 2 person operation, and finally 1 person operation. Beacuse the ride went upside down, people would lose all sorts of item from their pockets during the ride. So much so, that after many many years the lake was drained and many hundreds of dollars of coins were found in the lake beneath the ride. An over enthusiastic ride operator even once pressed the emergency stop when a cigarette light fell out of someones pocket and exploded on the roof of the queue house. Guests were often kicked out of the park after being caught spitting on this ride.